Mr. Clark graduated from Valparaiso University School of Law, ranked first in his class in 1990 and was Executive Managing Editor of the Valparaiso University Law Review. 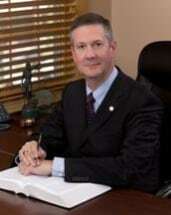 He is licensed to practice law in the states of Illinois and Indiana. From 1994 through 2006, Mr. Clark was Vice President and Senior Trust Officer of First National Bank of Illinois where he interpreted and administered scores of trust agreements drafted by numerous attorneys. This invaluable experience taught him first hand what works and doesn't work in trusts and estate plans. As a lawyer and banker, Mr. Clark has taught university and law school classes in personal finance and banking law...and has served as an estate planning consultant to other attorneys. Mr. Clark's interdisciplinary experience in the related areas of estate planning, investments and banking, and real estate and taxation allows him to provide more complete counsel to his clients. Mr. Clark is a member of the Illinois and Indiana State Bar Associations, member of the Lansing, Illinois Bar Association and treasurer of the Nordic Law Club of Chicago (association of probate lawyers and retired judges). Mr. Clark's prior real estate experience includes serving as Plan Commission and Board of Zoning Appeals attorney for the city of Portage, Indiana and town attorney for the town of Dune Acres, Indiana. He has also supervised the administration of hundreds of Illinois land trusts.